Rayla had rsted onto her back, a bored as heck expression on her face. Everything was boring lately. Nothing had interested her. NOTHING! She had tried hunting. She had tried play fighting with Thirahan and Vaynad. She had attempted to go on a professional hunt with her dad and had failed. Pretty much everything you could think of for fun she had tried, and none of them had satisfied her. So now here she was, lying on the beach of a small island with her paws dunked in the water, an extremely bored expression on her face as she stared out at the sea. She knew she was a trainee, but since she was older now it felt like she had grown stronger. Little did she know that another dragon, whom went by the name of Yjeladin, was skulking nearby, his expression blank. Yjeladin was a strange fellow, who had different beliefs then most dragons. He was also a rogue from the island of Drokvira. Drokvira was home to more then just rare subspecies of IceWings. It was also home to dragons unlike any other located on the planet. 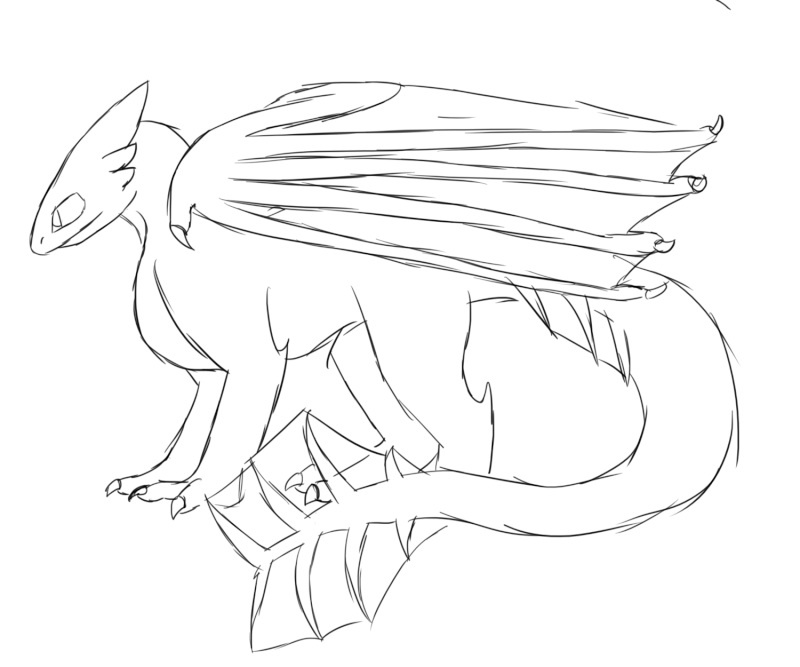 This included Yjeladin, A Firik dragon, bipedal dragons with wings for forearms. He had somehow wandered near SeaWing territory, and was looking for something good to eat, his satchel waving back and forth. He soon spotted Rayla, and, not wanting to surprise her, slowly crept up. Ark was going out for a hunt when by chance he spotted Rayla with a stranger.. Naturally he dashed to investigate. He noticed the stranger was indeed unique from any SeaWing, but the dragon was similar to Thirahan therefore he was more like a Wyvern. After a few moments Ark was closeby, emerging from the water he spoke. "Rayla you alright?" nuzzling her on the snout but keeping an eye on the stranger. He continued with asking the stranger, "Who are you, what are you doing here?" When Yjeladin spotted Arkhor, he smiled, raising his head a bit. An adult! That would make bartering exceptionally better. He didn't want to barter with a child, for he knew that he could easily overpower her little and easily entertained mind. It wouldn't seem like a fair trade if she gave him much but he little. Therefore he had planned on going soft on her, trading her a toy dolphin he had sculpted for a pearl or two. Now that an adult was here he could trade for a higher price, perhaps six pearls? Yes, that would be splendid! Or wait... what about some delicate sea coral? That would suit his collection quite dashingly! He was sure he could get a good price for high quality coral in the IceWing territory, where unfrozen water anywhere but the palace was an amazing site to see. Straightening up, he waited for the SeaWing to arrive. That was when Rayla noticed the firewing wyvern. Instantly, she leapt up, her frill jumping as she hissed in rage at the dragon for sneaking up on her. She unsheathed her claws, prepared to fight the stranger, when she noticed the strange satchel around his neck. She tilted her head at it. He was a lot bigger then her, maybe three times bigger, but she wasn't one to turn down a fight. It was obvious this fellow didn't want to fight, though. Curious, she sat down and watched him while her dad hugged her. Well, things just got all that more interesting for her. Tilting his head to the older SeaWing, Yjeladin approached, "Why, hello good consumer! I have come to the SeaWing territory to discuss matters of business!" Ark glanced at the stranger with a confused look, as he pushed Rayla behind him just in case. he replied "What business?" Ark was unsure what this dragon wanted, he had never seen one like him before. Wearing almost human equipment too, this gave him a bad feeling unsure what the dragon's real intentions where. Ark continued watching and curled his tail around Rayla for comforting. Yjel tilted his head to one side, then spread one wing to the side in an odd gesture of dismissal, "Oh, yes! I nearly forgot! Me and my silly brain ah.... My name is Yjeladin Morzonna "Prophet" Azin Varith, at your service, but you may call me Mr. Varith, when discussing matters of business!" said Yjeladin, having not answered Arkhor's question at all, he then trotted over and examined the water, narrowing his eyes at it, before reaching into his satchel with a claw on his wing. From it he pulled the weirdest little contraption you'd have ever seen. He then took a small glass tube that had been in the device and dipped it in the water, then once it was 2/4ths full, he put it back in the device and back in his satchel, nodding with pleasure. Noticing that Arkhor was still staring at him, he clapped his wings together and tilted his head, "Now, in order to do business, I must know my consumer's name. What is yours, fine Mr. and malady.....?" Rayla narrowed her eyes at the strange dragon, wondering what on earth and beyond he was blabbering on about. And what in the name of Phantom was a business? That didn't make the least bit of sense to her. And what was the device? It looked weird and strange. She wondered how sane this dragon was, and growled at him, her claws unsheathed as she stared up at him. Yet he was still a curious fellow, and she wanted to know more about that weird device he had hidden in his.... satchel. "Hey, uh, Veriath? Verrith? Varith? What ever, what was that device, and what do you mean business?" asked Rayla indignantly as she took a confident step toward the strange dragon, keeping her head high as she stared defiantly into his eyes. Ark slowly nodded his head, "The names Arkhor... God of the tides" he replied, still unsure about this strange dragon. He then gestured towards Rayla, "This is Rayla my daughter" After watching the strange dragon use what seemed to be a tool gathering some water. "Now what business?" Ark didn't know what he meant about business but it gave him a bad feeling, after all this strange dragon was in his tribe's lands and was creeping up on Rayla. Everything is quiet, and Moka is having a fun time at the beach. she raises her head and spots three dragons on the shore. curious, she heads to investigate. "Hi! my name's Moka! what are all you guys doing out here?" she asks curiously. Rayla hears a new voice, and turns around to spot a pink dragon wearing some sort of pendant. She growls again, her frills standing on edge. This was SeaWing territory! What were other dragons doing in her territory?! Growling with anger, she leaped out of her father's grasp, snarling at the new approaching dragon, her claws unsheathed. Despite being tiny, Rayla could appear ferocious. could. That didn't necessarily mean she was being threatening at the moment, since she had been quite tired from lying in the sun all day and was still a little off her feet. "Who are you and why are you in my dad's territory?" asked Rayla angrily, her tail whipping back and forth. Yjeladin was curious with this new fellow as well. She appeared to be a rogue, yet he could never tell with scale color. She was certainly a beauty, that was for sure! Then he noticed the rosary around her neck. Oh, what exquisite craftsmanship! What I wouldn't give for a rosary like that! It was absolutely perfect! Yjel stared at the pendant in awe. What was that worth? Thirty pearls? Forty? Maybe even a few fire embers.... those were hard to come by now a days... but Yjeladin needed to have a necklace of such magnificent glory! Walking toward Moka and ignoring both Arkhor and Rayla, he dipped his head to her, and reached into his back, pulling out three glowing-red gems. Fire embers. Rare crystals formed from volcanoes. Very hard to come by. One crystal should be enough to pay off that fine jewelry, perhaps two if the owner was fickle.... maybe even three if the item was of precious and sentimental value to the consumer.... maybe even a few pearls..... "Hello, madam! I see your rosary is quite beautiful! You must have paid quite a pretty penny for such artwork! I am willing to trade one fire ember in exchange for such a beauty! Would you oblige?" he asked, holding out the gem. At first Moka was a bit confused, then she spotted Akre and rushed toward him, ignoring both Yjeladin, who looked upset his offer had been turned down, and Rayla, who was steaming furious at being ignored at the moment. "Oh, Akre, how I've missed you!" she exclaimed, hugging him, "It's been so long! I had so much important stuff to do at the NightWings I barely had time to send you a letter! I'm so sorry!" "just don't leave without notice again please Moka" Arcke and returning the hug, since their last meeting Arcke grew about 2 ft and generally gotten older like a deeper voice, etc. "Oh, it is beautiful, Akre!" exclaimed Moka, taking the trinket and admiring it in the sunlight. It shimmered and swayed as Moka put it around her neck, now having two different pendants. She hugged Akre again as she helped him to shore, Rayla still sizzling. Yjeladin looked displeased by the trinket Moka was wearing. Rayla stared at Akreious with the most confused look ever. How did this dragon know her name? She had never even seen him before! Shaking her head back and forth, she sat down, tilting her head to the side as she watched the scene unfold. This certainly hadn't been what she was expecting from lying bored on the beach. Then again, a dragon's lifestyle was pretty complicated. Ark was slightly confused what was going on, it seemed that Yje didn't seem that bothered with him or Rayla anymore. He proceeded to nuzzle Rayla giving her a nip on the ear. "You sure your alright?" he asked, after which he walked closer to Akre and the other dragon, he wondered what they where doing here. Since they where quite far into the Ocean, but he ignored them and focus on Rayla who must have been bored. Rayla looked up at her father, sighing, her shark tail swishing back And forth in agitation. "Dad, who are all these people? And why are they in our territory?" she asked as she nuzzled him and attempted to climb up onto his shoulders while also watching the strangers. Ark smiled, lowering his shoulders and helped her up, he replied "Well thats Akre, the other two I havn't seen before. Well don't know why they are here" giving her a nuzzle carrying her weight, she had grown quite alot but he could keep her up. He walked closer to the group, to ask them why they where here. First to Akre, "Hey Akre, what you doing here?" Yjeladin frowned when he noticed that the lovely pink dragon had accepted such a minor gift. It was terrible craftsmanship and he could barely even tell what it was. Not even worth a pearl, he thought as he shook his head in disdain. Walking over to Moka, he tapped her on the shoulder, "Ma'am, I was wondering if you would so humbly trade that rosary for a fire ember.." he said, holding up the glowing red gem in his claws. It sparkled brilliantly, but Moka didn't appear all that interested in it. Moka looks at Yjeladin with hesitation. Who was this strange dragon? Curious, she replies with a half-confused tone, "Um, no sir, you may not have my pendant. It is very valuable to me and if anyone else came into possession of it I wouldn't be able to live!" she said, holding Akreious' trinket and the rosary in her claws.